New book, some shelf wear to cover, 240 pages. Large format book, dozens of glossy photos. This book looks at the story of the conflict away from the well known fronts and the set piece battles, concentrating instead on the hidden methods that so affected the course and purpose of WW2. 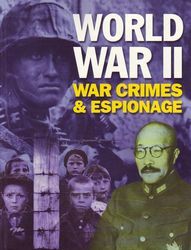 It is the story of man at his most inhuman, evil and corrupt - of the racial obsession that drove the Nazis to genocide; of the brutal torture in Singapore's notorious Changi gaol; of the massacre in cold blood of Polish officers at Katyn, and many others.